You can easily find out who spends the most on presidential ad campaigns. Have some toddlers watch T.V. all day and the owner of the jingle they start singing at the end of the day is your best bet. I have a kid who sings Manny Villar’s jingle with so much energy you’d think she was a walking ad commissioned by Villar. It’s scary really. I work at home where the T.V. is on for fifteen hours a day so I know for a fact that Villar’s ad recurs with the same level of frequency as untreated bad breath. At first, you squirm at the cheesiness but listen to it long enough and you start to imbibe the kind of desperation that might just push you to darken the circle beside Villar’s name come election day. This is hypnosis at its best and proof that candidates in the Philippines don’t need to speak candy-coated trash to be convincing. They just need to know how to swim. 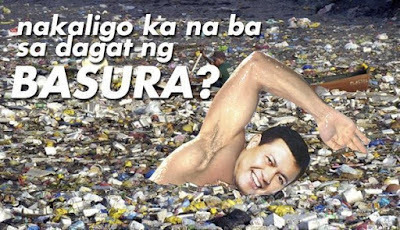 “Have you ever gone swimming in a sea of trash?” Villar asks. No, none of the other candidates have or those that have may have died of leptospirosis. Only he has ever done that, evaded bacterial infection and gone on to become a top presidential bet we should all vote for because he bears the scars of poverty. Villar knows one must woo the poor to win in the next elections, hence that excellent swimmer’s form. All the candidates know this but not everyone can look good in a sea of trash. I don’t know if I’d like to take swimming lessons from Villar. I get bothered by the thought of voting for someone who has no qualms about spending millions to appear one with the poor. *I saw the photo on top a couple of days ago in the news and I found a copy in Facebook. I don’t know who made the photo but I must say that it gave me quite a good laugh. Thanks to whoever is the artist. @diabetes mellitus- the candidate is asking through this ad campaign if the other candidates have ever swum in a sea of trash. what he is really asking is if the other candidates are truly one with the poor, the kind of poor who live in dirty hovels. in the philippines, there are more poor folks than rich folks. so the candidate who can appear to be more one with the poor is the one who might get more votes. funnily enough, i like the villar song. it's got a nice melody - if you can stop thinking about the lyrics. there are even spoofs of that song spreading all over FB - like the "nursing hymn"
and, no, hearing it far more often than i wish doesn't make me want to vote villar. nuh-uh. kudos to villar's composer. it's a "last song syndrome" kind of song. hehehe. actually, i am writing for a boxing website na. online ka YM? we can talk there. And no, hindi pa ako nakaligo sa dagat ng basura. But I did spend Christmas on a ship on my way home. It may sound appealing but it makes the FILIPINOS BOBO!! Ma'am! Your alive! Belated Happy new year to you and your darling children and hubbykins. I hope living in Barney's belly has been treating you well ma'am. At least from what I understand, you get to work at home. But HOLY CRAP! You say our KHS days were SIMPLER?! Damn. I hope this new year treats you better than the last. Good blessings to your adorable children. I wish you good health and sanity throughout this year! it's always such a pleasure to hear from you mary and thank you for the good wishes. may you have a great year ahead of you too.